All buildings need maintenance from time to time. For various reasons and neglect of maintenance is one, repair is also needed. Historically significant buildings are often conserved; that is they are maintained and repaired in ways that maintain the special historic interest and character of the building. › Click here for more information about specifying works. › Click here for more information about finding a thatcher. Routine work is necessary to keep the fabric of a building in good order. Thatch is no different and will need some attention from time to time. Simple measures can be taken by the property owner to ensure the thatch has the best chance of performing well. Removing branches of trees that over hang the thatch. These can restrict solar heat and wind turbulence, keeping the thatch damp. Drips can also cause mechanical damage. Remove leaves that become lodged in wire netting and that stop the thatch from drying out. Fix television aerials or dishes inside the roof space where possible. If this is not possible try to fit them away from the thatch and not on chimneys, as this will eliminate the need for technicians to physically get on to the thatch in order to carry out any repairs or renewal of such equipment. As a general rule, the less disturbance of thatch the better, so it is important that no one gets onto the thatch unless absolutely necessary. Moss and algae can indicate that the surface of the thatch is consistently moist enough to support growth. However, its presence usually indicates a damp environment rather than a failing thatch. It isn’t necessary to remove moss and the effects of moss killer treatment and algicides on the thatch itself is little understood and should be avoided. As an organic material, thatch is prone to deterioration through environmental conditions and damage through use. Repair is work beyond the scope of maintenance, to remedy these defects or damage. Many thatched property owners like to have their property looking ’just thatched’. Although this looks pleasing, it is not an indication of healthy thatch and unnecessary re-thatching is a needless expense. As an organic and biodegradable material, thatch will start to decay as soon as it is put on the roof. The warm, golden colour that is so pleasing will soon darken and go grey. But even as it changes visually, a thatched roof will have many healthy years. 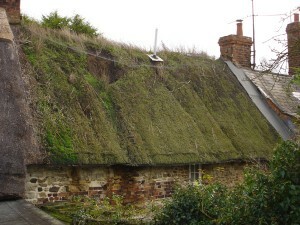 Complete renewal of a thatched roof or re-thatch is rarely required. This is the entire removal of the existing thatch and replacement with new. It is costly to the owner because of the removal and disposal of the existing thatch and the repair of the roof structure in order to fix the new thatch. New thatch is now clamped into position with long steel nails (crooks) which must be driven into the rafters to ensure a secure fixing. A crook will often split an ancient pole rafter, so that stripping usually creates a situation where the old timbers must also be replaced with new rafters before the roof can be re-thatched. For the owner, this means greater (and in most cases unnecessary) cost and bureaucracy to acquire consents to have the work done. 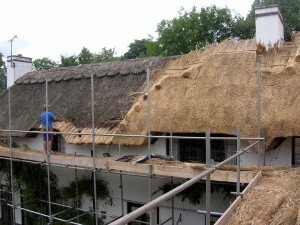 Re-thatching of water reed usually involves stripping the old water reed roof back to the timbers. It is generally fixed with iron crooks directly to the rafters and so this requires all existing thatch to be removed and the rafters to be sufficiently structurally sound to withstand new fixings. Consequently, ancient thatch is removed and disguarded and historic rafters are replaced. This seems more to do with convention than necessity, although in some regions where the roofs are more steeply pitched it has been found that reed can not be attached securely to existing thatch coats. Some thatchers prefer to re-thatch in water reed for reasons quite unrelated to conservation issues. Tying (which takes longer) and/or screw fixings can be used to attach reed to rafters. This may be termed ’restoration’, that is to return a place to a known earlier state, on the basis of compelling evidence, without conjecture. However, understanding the materials of the earlier state is sometimes contentious. Conservation philosophy not only advocates minimum intervention, but also ‘like for like’ replacement. This means that long straw should be replaced with long straw and water reed, replaced with water reed. However, availability of materials and limitations of skills can often mean that a roof is thatched with what ever is available or cheaper, or which material a thatcher is more familiar applying. Variations in materials leads to the erosion of the traditional and vernacular styles of thatching. Read more about the issues surrounding interpreting thatch conservation guidance. If an archaeological investigation is needed then this must be carried out in advance of any repairs or re-thatch. A guidance document on this subject is currently being prepared. There are few individuals with the knowledge, skills and experience to undertake an archaeological investigation. Here are some of the repairs that may be necessary from time to time. The ridge protects the apex of the roof, where the roof slopes meet. 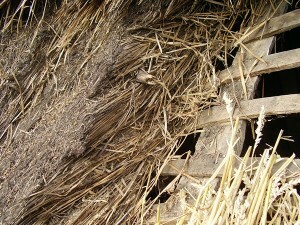 It has to withstand the impact of weather and as such is prone to deteriorating at a faster rate than the main thatch. The ridge is an essential element and will need replacing several times during the life of the main coat (approximately every 7-10 years). It should be replaced before it has deteriorated to the stage where water ingress may damage the main thatch. The ridging material has eroded or slipped leaving the spar fixings protruding by 2 inches or more. When the ridge has depressed, or the basecoat is showing through. Localised damage can be repaired by introducing, dressing and securing an amount of new material to just the affected area. Decayed thatch can be removed, and the area is made level with the surface of the adjacent thatch, using rolls or wads of straw tied with string or straw bonds, secured by sparring into the thatch below. It is then re-thatched in overlapping courses and secured with surface sways and liggers. At every course the patch is widened to ensure the one below it is watertight, and the final upper course is tucked under an intact course, or (if the patch reaches the top of the roof) under the ridge. If decay extends through the full thickness of the thatch, all the area must be stripped back to the timbers and new bundles tied to the rafters to form a base coat, before repairing as described above. Care should be taken to avoid disturbing the main coat of thatch on either side of the patch. Traditionally, smaller areas requiring repair were patch repaired. On a long straw roof this new material is referred to as a ‘stob’. 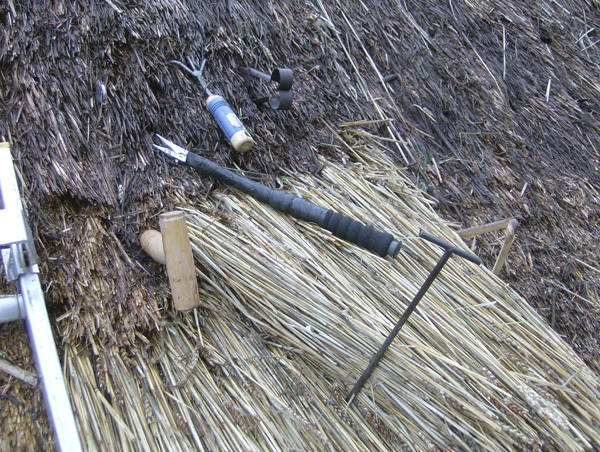 However, this type of repair can only be used where thatch has been fixed with tied sways. If spars have been used they restrict the ‘stob’ being fixed into place. A roof is only as good as the amount of serviceable thatch material covering the fixings, and once these fixings are exposed, rainwater may track down them and damage the basecoats or, in the case of single coat thatch, the fabric of the building. Eventually the thatch will deteriorate to an extent that the majority of its surface area no longer sheds water effectively. At this stage, it will be necessary to apply a new coat. This is called re-coating, spar coating, or overlaying. A ‘rick thatch’ a few inches thick, fixed either with surface or hidden fixings, can be applied to roof sections that have decayed more quickly than the main roof, so that the whole roof can eventually be re-thatched in one event. Some thatchers will also rick thatch a roof if an owner is short of funds to pay for a full re-thatch and the weathering coat has failed. A rick thatch can be applied fairly quickly and uses a third or less of the material used in a full re-thatch. Historically, many roofs were re-thatched in this way, a new section being recoated each year with enough straw to provide 4-7 years of cover. In practice, a little re-thatching work occurred every year, whether this was re-ridging, patching, repair, or rick thatching if straw was in short supply. Much of this work was done by the farmer/owner or farm worker, while professional thatchers maintained the roofs of higher quality buildings. Most of the buildings that were maintained by DIY thatchers have disappeared, and the craft is now entirely in the hands of professionals. Consequently, owners of most thatched buildings now prefer to have their roofs re-thatched all at one time, and are much less willing to tolerate ‘rick thatching’, ‘sectional’ recoating, patching or point repairs. When the top weathering coat of a long straw or combed wheat reed roof has deteriorated, the traditional method is to fix a new coat of thatch to the existing basecoats. There is clear evidence that this method was used historically, and over the course of a thatched roof life these layers could accumulate, increasing the thickness of the thatch. However, few historic roofs are more than 1.5m thick and so it would seem that once the thatch became greater than 1m thick, the previous spar coat was removed entirely before attaching a new one. If the existing thatch is left, new thatch work is applied between 250 – 300mm thick, which can increase the overall thickness. Building up the thickness too much can be detrimental since it not only adds weight to the roof structure, but reduces the height of chimney stacks which can potentially increase the fire risk (read more in Fire). Any base coat being over-thatched must be tight and well-secured to the roof frame. Any sodden or decayed material should be carefully removed and replaced and any loose material re-fixed. This will then provide a sound surface into which the fixings of the subsequent new thatch can be anchored. If the basecoats are no longer secured to the roof frame, measures will need to be taken to ensure that further slippage is avoided by reattaching the basecoat to the timbers. This will need to be done sensitively to avoid further damage to the underlying structure. This option allows as much of the historic thatch to be retained and keeps the new material (and costs) to a minimum. During recoating, the eaves and barges are often stripped back to the rafters and new eaves, before spar coating the new thatch in place. However, in the past the eaves were sometimes simply cut back flush with the wall, and the new coat sparred into the old. If the supporting roof structure fails, the overlying thatch can slump or collapse. On a thick multi-layered roof, a minor collapse is not normally a problem because the thick base layers are tightly knitted together and supported by the rafters, but on a thinner coat even a small collapse will create a dip that can concentrate water. Localised repair to the roof structure can be done from within the roof space. New battens should be inserted from within the roofspace if possible, before repairing the thatch itself. If decay and deterioration are more widespread, there may be no alternative but to strip the roof completely in order to replace the support, prior to re-thatching. Although treated softwood timber battens are normally used nowadays, there is no reason why historic supports such as riven lath, wattle or fleaking should not be replaced, and in the case of listed buildings this might well be a requirement. In buildings where the underside of the roof will be exposed, such supports may provide a more attractive appearance. Any structural faults affecting the primary roof structure must be addressed, following advice from a suitably experienced building professional, prior to repairing the thatch itself. Some thatchers undertake this carpentry work.